Firstly I bonded my brass sheet with craft foam and then ran it through my sizzix to cut a rectangular shape. This was then put through again inside a cuttlebug embossing folder. The resultant image was then randomly inked with Ranger alcohol inks. 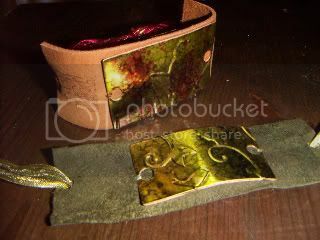 Leather was cut to create the bracelet, 2 holes punched in the brass and the brass sewn to the leather. Bird images were then stamped in StazOn on the brown one (not on the green, the suede on this is much darker than shown in the photo and I might add some beads to it). 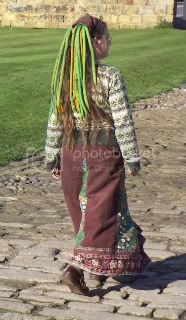 Ribbons were attached and threaded through further holes as fastenings. The brown bracelet is for the monthly art raffle swap, the green is for me (and I'm wearing it at this moment). I loved the end effect but find the ribbon fiddly to tie. I will probably try making them with resin poppers to fasten next time. 1)I love the sign in page, like a collage of different styles. 2)First is mine, beading on a camouflaged bird. Quinnan's has a pretty, intricate little fairy charm which is so sweet. Wisher's is pretty and has my favourite - lace. Rainbowjoy's - oh my! The embroidery and the jewel-like colours! 3)Love Sarah's very cute bird which can be hidden in the pocket. I will be using this idea in my next piece of work. Efemera's has a gorgeous flower, lovely choice of colours and great stitching. Flo's alien is one of my favourites - so cool and very original. 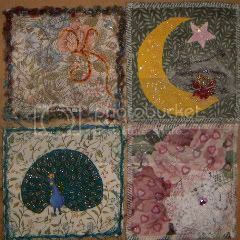 Irboo's piece is so pretty and textural. 4)Lou's is striking and her stitching is so neat! Magpie did a very beautiful rose with fabulous stitching. A lovely piece I could frame. new2this' piece has lovely beading and stitching work. 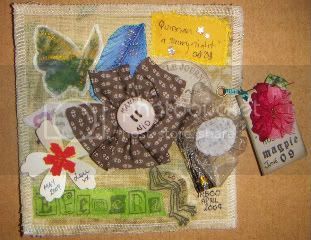 MandyNio included amazing beads and embellishments, a very beautiful piece in my favourite colours. And I've photographed it upside down! Thank you all so much, they are all stunning and will make a fabulous wall hanging. 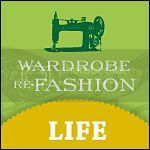 For a while I've wanting to make a dress using upholstery fabric that has been distressed. I've had this fabric for years and have previously used some to make a beautiful 50s dance dress which I showcase on my mannequin at festivals. But I wanted to make a dress with a lighter, more distressed feel. 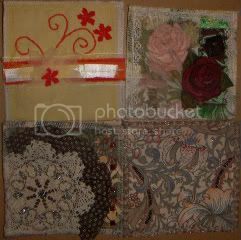 A recent article in Altered Couture spurred me on to do this project. The Romance tea dress was made using uphlostery fabric and lined using an identical dress in vintage cotton sateen curtain lining. These 2 were sewn together with external, frayed seams. I then randomly tore strips up both layers of skirts, of different widths and lengths. 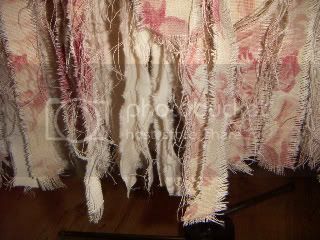 These strips the were then frayed by hand and with a wire brush. 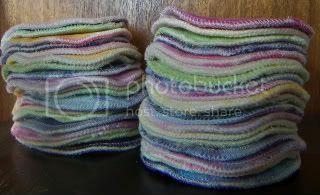 Loose threads were left to hand down. A fabric rose was made and sewn to the neckline. The back opening had eyelets applied and was laced with red chiffon ribbon which looks very effective against the paler fabric (I did this after photographing it, will take another pic at some point). I'm very please with the result, very pretty and romantic, but I feel she might acquire more decoration. 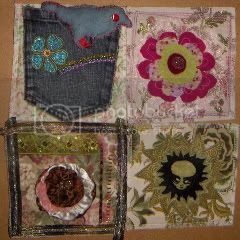 Grungepaper flowers are all the rage on blogs at the mo and UKStampers has hosted a swap of a single flower. This was my first go at using grungepaper and, to be honest, I didn't like the effect of distress inks on it - I don't think it's going to be my favourite medium. 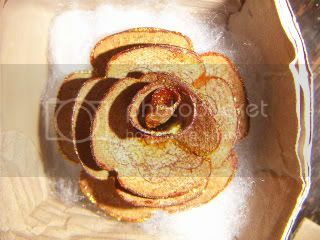 I altered the colour with distress inks in spiced marmalade and vintage photograph, stamped a medallion and made the rose using the instructions on the Studio 490 blog. I then highlighted with some orange stickles. Not really very adventurous, and I think it has the touch of a maiden aunt about it! The other swap I'm involved in is a recycled packaging one. 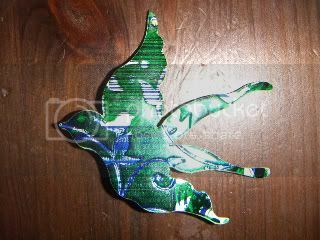 For this, I adhered some foam to a piece of can, cut a bird shape with my sizzix dies and then embossed it with a birds and swirls folder. I inked it with StazOn then adhered a brooch pin to the back. I hope my swappee likes it. For the past year I have been taking part in a fabric CJ and I've seen some phenomenal work. I've just opened my returned complete CJ and it is really beautiful - I'll post up some pics next week. I thought I'd share the last 2 entries I made to other peoples' CJs. The first is made by applying patterned tissue paper to muslin to creat a fabric paper - this is sewn on to a co-ordinating upholstery background. 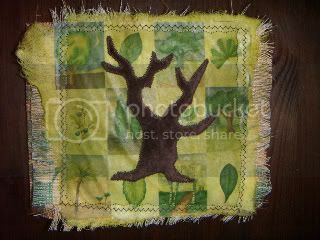 I then appliqued a tree made from hand dyed organic bamboo velour, cut with a sizzix. The edges are left rough for a distressed effect. For the second, I was inspired by a trip to Greenbelt. where my youngest son fell in love with the bubble store. 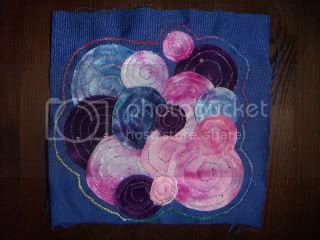 I hand dyed organic bamboo velour in shades of pink and purple, then cut them into a variety of circles and appliqued to the navy base with freeform spirals of variegated yarn. Further stitching surrounds the bubbles and beads were applied randomly to accent the design. It's called Bubble Candy. I greatly enjoyed being involved in the CJ, I learnt so much from all the artwork I saw during its progress.